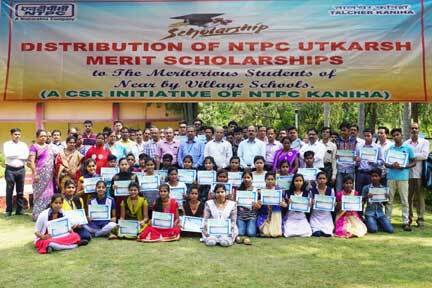 Kaniha: “NTPC Utkarsh” Merit scholarship was provided to meritorious school students and college students of Kaniha block by NTPC Talcher Kaniha in a special function held on October 16,2018. 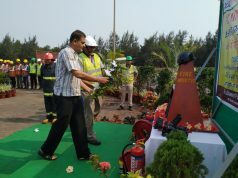 Total 40 candidates received the scholarships. 37 toppers of 10 th Class Boards exams, 1 topper of 12 th Boards exams and 2 toppers B.Tech student under Kaniha block were awarded with scholarship. An amount of Rs.3,000/- to 10 th and 12 th class meritorious students was provided whereas the B .Tech student was given scholarship of Rs.90,000/-. The scholarship was given by Shri Santosh James ,Chief General Manager ,Talcher Kaniha in the august presence of Shri K S Sarma,AGM(HR).While addressing the students on the occasion ,Shri James said “ the scholarship amount will help the students in their studies”. On this occasion he motivated the awardees for pursuing higher education through continuous studies. He inspired to become good citizen. He reiterated that the small finance assistance by NTPC shall encourage achieving awardees’ goal and aspirations. The objective of the scholarship was to promote the poor and weaker section of the society and specially to motivate the girl students towards education for a better future ahead.